Winter is upon us, which means for many that it is time to bring their snowmobile out of hibernation and put it to good use. Prior to taking your toy out for an exhilarating spin, there are some preparations to take in order to ensure that everything is in working order. 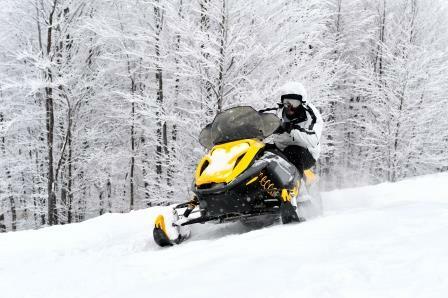 While you should always refer to the owner’s manual for general maintenance, cleaning, and repairs, most snowmobiles operate in the same way and there are a number of things you can do to make sure that your winter ride is hassle-free fun for all. This should be conducted in an area that is well lit so you are as thorough as possible. Make sure to check all of the parts to make sure nothing is loose. Furthermore, common areas that show wear and tear include belts and idler wheels. If you own an older model be on the lookout for areas of stress, buckling, and cracking. A grease gun can be used to lubricate all the points listed in the manual, although be sure not to use an excessive amount of grease. The main fluids that you should be concerned with when taking your snowmobile out of storage include your gas, brake fluid, and coolant. If there was gas left in your tank while it was stowed away, drain the remaining that is left before adding any fresh gas because it may have deteriorated over the months that it was not in use and could potentially affect the performance of your snowmobile. If your brake fluid is low, top it off using the specified grade outlined on the master cylinder. Fresh coolant should be added as well. Dirty carburetors are the main cause of engine failure after taking snowmobiles out of storage. Consider cleaning this with carburetor cleaner along with basic tools. A few other areas that should be checked for damage include the throttle, oil cables, fan, and water pump belt. Often there can be cracks in these important functions which could spell disaster if not taken care of before the first use of the season. This is probably one of the most important aspects of your snowmobile. Without skis in proper working condition, it may turn into a costly or dangerous endeavor and you won’t be going anywhere. If your snowmobile is equipped with steel skis, check for holes that may have worn in them. For plastic skis, look for gouges or cuts. Lastly, your runners should be straight. If they are bent, it is a quick repair in the shop or a vice can be used to straighten them. This one seems a bit obvious, but many people forget this step. Wash off any salt, dirt, leaves, or other debris that may be on your snowmobile. This can easily be done with a hose or bucket of water. If you want a deeper clean, take it to a local car wash. Seats can be cleaned with upholstery cleaner. During this step, also check for any clothes or plugs that were used to block off the air intake and exhaust apertures. Prepping your snowmobile for storage involves a similar evaluation of that when it was being taken out for the season but in reverse. If you take the right steps and store your snowmobile properly and provide continuous maintenance, it can slow down its aging and provide many years of fun-filled adventures. 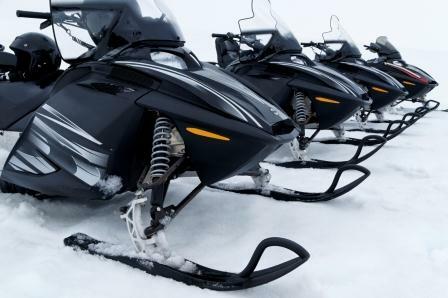 For snowmobile storage, it is, once again, time to give your sled a bath to wash off all the corrosive elements that may deteriorate your toy while in storage. Next, you will want to add STA-BIL® stabilizer to your gas tank in order to stop solvents from evaporating. Fogging the engine is the next step and ensures that corrosion doesn’t develop while in storage. Draining the carbs should be done after fogging and helps prevent the gas from damaging the snowmobile’s metals. After this, you will need to remove the belt and lubricate all required areas outlined in your manual. Removing the battery is essential to prolonging its life. Furthermore, you will need to block the exhaust, air intake, and cooling holes so no debris gets inside. Finally, you will want to store your sled in a dry place, preferably on a lift or dollies to prevent moisture corrosion. Some choose to store their snowmobile professionally, but this is not necessary. Now that you are set for both storing and using your snowmobile in a safe and proactive way, your knowledge will ensure many more years of fun on your sled!